Wastewater and material enters the septic tank from your houses sewer pipes. 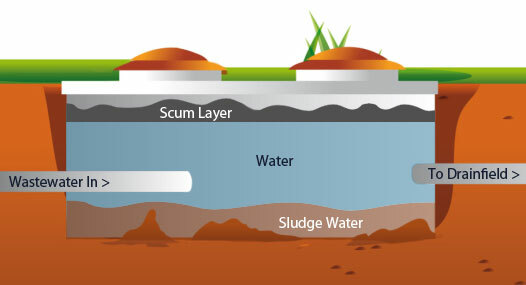 The heavy solid waste sinks to the bottom to form a sludge layer. The lighter waste floats to the top and forms the scum layer. The middle layer is a liquid wastewater that contains bacteria and chemicals and is mostly free of solids. The septic tank produces foul-smelling gases that are caused by the waste being broken down by the bacteria in the wastewater. This breaking down causes a residue being left behind, which tends to build up over time and must be removed before it is allowed to enter the drainfield and clog the entire system. The drain field is made up of perforated pipes buried in gravel-filled trenches. The water is then absorbed and filtered by the soil in the drainfield. Gravity is all that powers a septic system as water flows from the house, to the septic tank and ending into the drainfield.